Council of Europe Commissioner for Human Rights Dunja Mijatovic has given an interview to Kayhan Karaca from Deutsche Welle Türkçe and explained the reasons why she will get involved in the case of businessperson and rights advocate Osman Kavala. Mijatovic previously released an opinion report, where she argued that the abuse of anti-terror laws has a negative impact on freedom of expression. In her interview to Deutsche Welle Türkçe, Mijatovic has shared details about the Turkey section of her report. Mijatovic has said, "The document which shows that the abuse of anti-terror laws has a negative impact on freedom of expression is important for all countries of the Council of Europe. I am of the opinion that it is time to discuss this issue openly." Emphasizing that "the struggle against terrorism is a legitimate right of every government", Mijatıvic has added, "This struggle cannot be waged at the expense of human rights and, especially, that of freedom of expression." 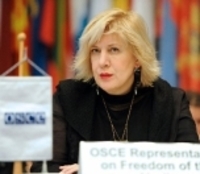 "The ones that they view as potential terrorists..."
Stating that Turkey has several laws on struggle against terrorism, Dunja Mijatovic has further commented, "I am closely following the issue. Some laws which have been adopted in Turkey for struggle against terrorism have made life impossible for some people in the country." Mijatovic has also added, "There are some people who have been arrested or facing charges because they are viewed as potential terrorists or they have got involved in terrorist actions. I want to bring this issue into the agenda of the authorities in Turkey in my next visit to the country." "Kavala case is causing fear in civil society"
Commissioner for Human Rights Dunja Mijatovic has stated that she decided to get involved in the case of Osman Kavala after 13 academics and civil society representatives were taken into custody on November 16, 2018.